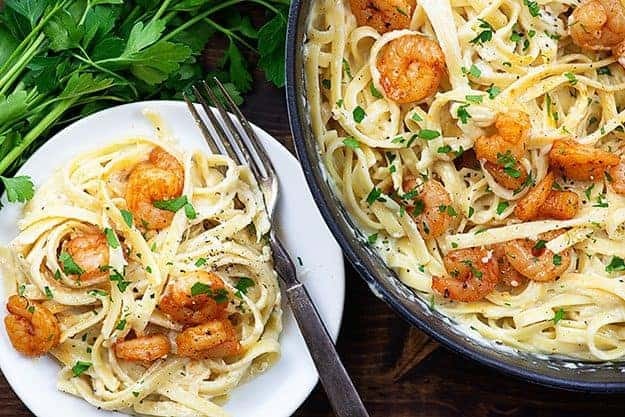 Shrimp Alfredo is a quick and easy dinner, but it sure tastes like you spent a lot of time in the kitchen! Is a pastaterian a thing? Because I’m really thinking about becoming one. It’s all pasta, all the time. No shame. Especially when there is homemade Alfredo sauce involved. 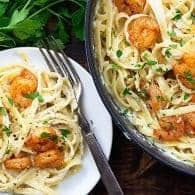 I skipped the chicken and turned this into a shrimp Alfredo recipe this time around. I’m not mad about it. 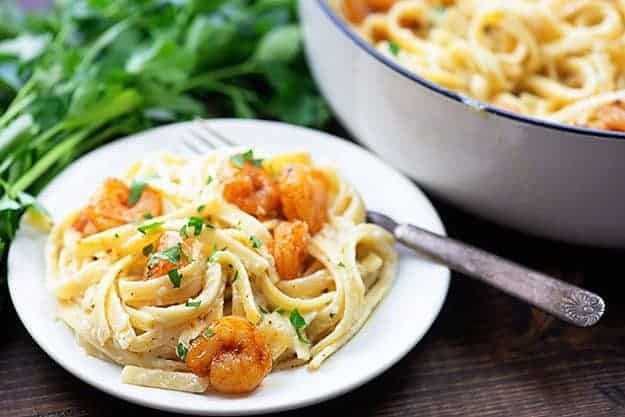 Shrimp fettuccine Alfredo is a pretty tasty switch from the traditional chicken. I mean, don’t get me wrong – I love chicken! But sometimes I need a change. Enter shrimp! 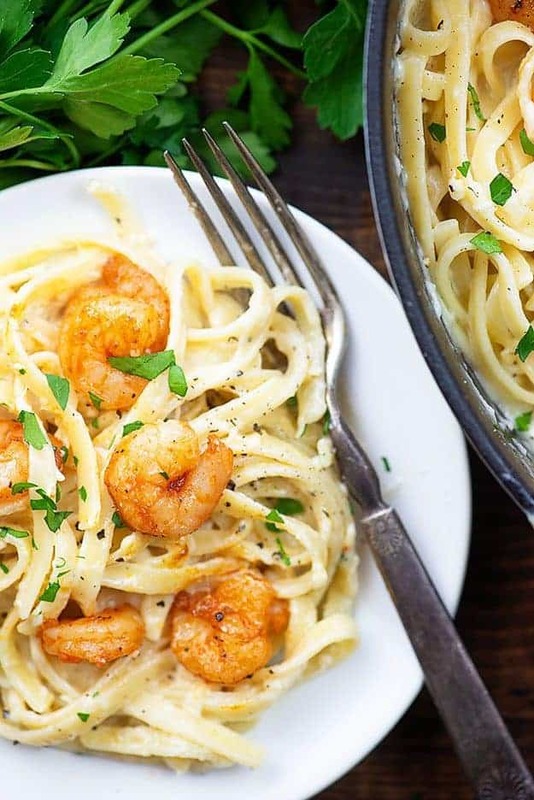 This garlic shrimp Alfredo is so quick and simple to prepare. You’re going to look like a pro! To start, get a big pot of water boiling and cook up your fettuccine. While that is cooking, melt some butter in a skillet and add in your shrimp. We’re seasoning the shrimp with paprika, garlic, salt, and pepper. Easy stuff here, but big flavor! The shrimp only takes about 5 minutes, which I love. Much faster than cooking up chicken, right? Once the shrimp is fully cooked, remove it to a plate and set aside. Wipe the skillet out and let’s get started on our Alfredo sauce. 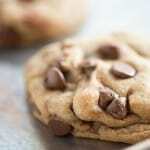 Melt a stick of butter in the skillet and whisk in some cream and garlic. Once everything is nice and hot, remove from the heat and stir in some freshly grated Parmesan cheese. 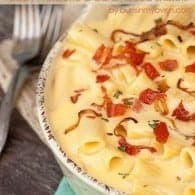 Keep whisking until the sauce is smooth and creamy! 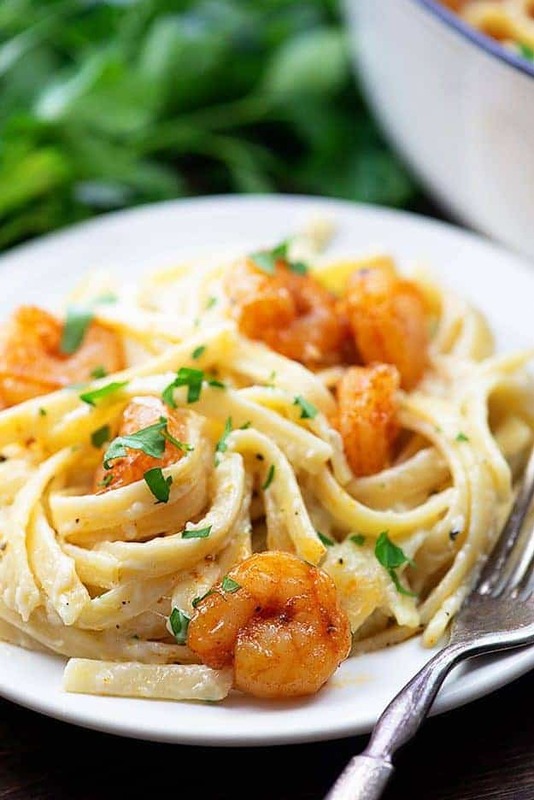 Add your Alfredo sauce to the cooked and drained fettuccine, toss well, and add your shrimp back in. 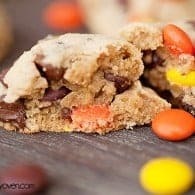 How easy is that recipe? Can Alfredo sauce be made ahead? This is one of those sauces that is really best made fresh. 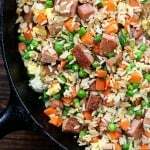 It doesn’t reheat very well as it tends to separate and get a bit oily. Luckily, Alfredo sauce really only takes about 10 minutes to make, so making it fresh isn’t much of a problem. What goes with shrimp Alfredo? 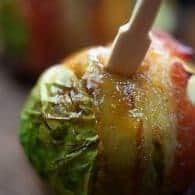 Personally, because this dish is quite rich already, I like to serve something simple on the side, such as a green salad with an oil and vinegar type of dressing or some steamed broccoli. My best ever garlic bread is quite heavy and cheesy, but I’d never turn it down and do often serve it with Alfredo, as well. My family loves this one and it feels a little fancier than our usual fare of one pot spaghetti or stuffed peppers. Want more shrimp recipes? Click that link for the best one yet! 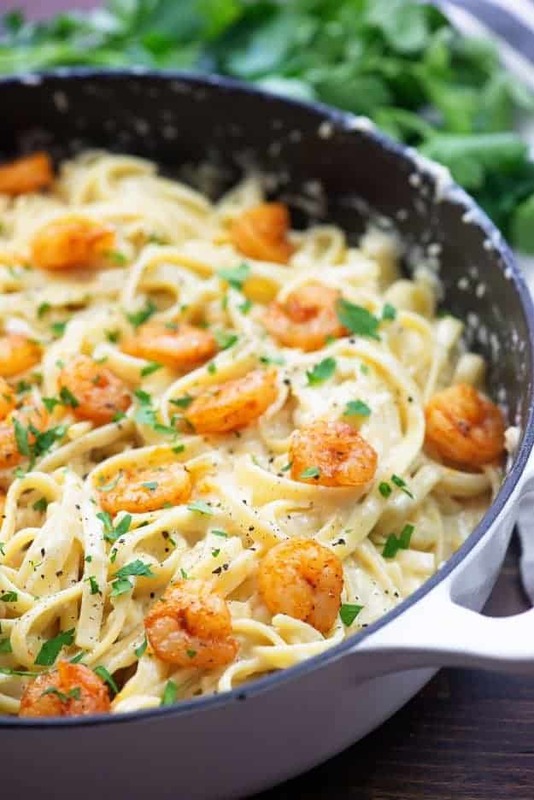 Give this easy shrimp Alfredo recipe a try and let me know what you think! Homemade Alfedo sauce, perfectly cooked shrimp, and a pile of pasta! Dinner doesn't get much better than this. Bring a large pot of water to a boil and add the fettuccine. Boil according to package directions. Meanwhile, add the butter to a large skillet over medium heat and melt. Add the shrimp to the skillet and sprinkle with paprika, salt, pepper, and garlic powder. Stir to coat the shrimp. Cook for 5 minutes or until shrimp are cooked through, stirring occasionally. Remove shrimp from pan and set aside. Melt the butter in a large, deep pot. Stir in the heavy cream and garlic and whisk to combine. Remove from the heat and stir in the grated Parmesan cheese, whisking constantly until the sauce is smooth and creamy. Add the drained fettuccine to the Alfredo sauce and top with shrimp. Pastaterian here for sure! 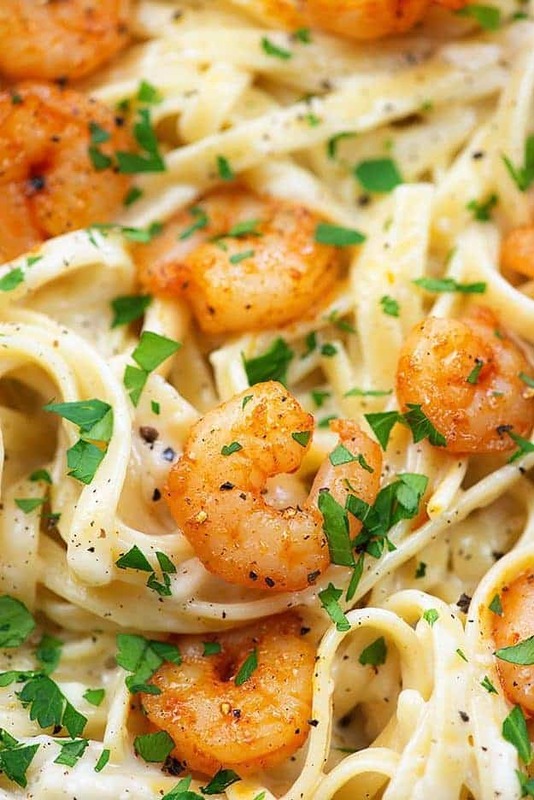 In fact, pasta and shrimp is my favorite dish, something about this combo I simply cannot resist. Love that you added your own homemade alfredo sauce. Perfecto!